This album covers some of her last "real" recordings. Although she would continue on for quite a few years in radio, this album covers some of the last tunes she put to vinyl. In this album Brian finally gets "Wally's" name right. In earlier liner notes he still refers to him as Herman, which no one ever called him. However, Brian still does not know Annette's true age. It could be because Annette did not like "those baby voices" and thought that if people thought she was 16 instead of 26 they would accept "those baby voices". 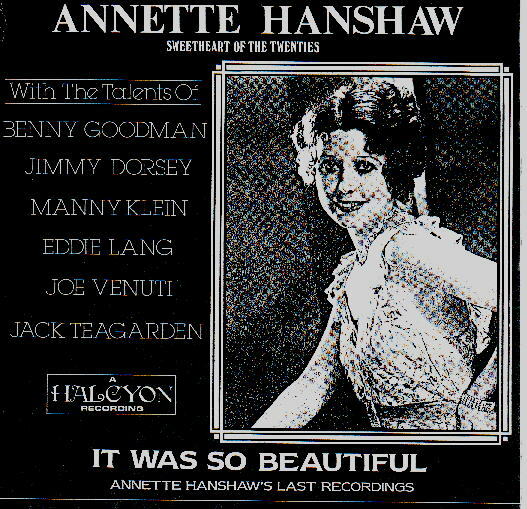 In any event this album contains one song that is pure Annette but could have been recorded by Helen Kane. That is "This little Piggy went to Market". It is classic "fun" Annette and one that every mother probably sang to their children to get them to eat their supper. In this album we are introduced to the more mature Annette. Gone are the old "That's All" endings which by this time Annette thought and probably rightly so that it had lost its innocence. We are now introduced to tunes that are not so much happy or sad but one of quiet desperation and resignation. Witness "I Cover the Waterfront" and "Say it isn't So", "Moon Song", "Twenty Million People", and "I'm sure of everything but you". In these songs comes more than just sadness and thoughts of suicide but actually of numbness, the old Edgar Alan Poe sense of helplessness, and numbness that one is so totally lacking in a emotion that one doesn't even have the power to fight back. But true to form, Annette can come right back and give the happy little ditty, "This little Piggy went to market" and "Let's Fall in Love", both remarkably happy tunes. Their paths were so close to meeting many times and in this album we finally get to hear Annette sing a Crosby tune, "Love Me Tonight". She also sings another unreleased song by Crosby's pal Harry Barris, "It was so Beautiful". In this her final album we again see her "integrating" all the human emotions that a singer can do. She could "integrate" every human emotion from many different persons and become that person, become that emotion. That is what a good artist will do. And that is why she seems as modern today as she was back then. For her "time" has no meaning. That is the essence of art. As I said before, "Art will endure". When others are long forgotten, new generations of fans will listen to Annette and find her songs new and impressive.